One of the Pacific Northwest's most noteworthy decoy carvers was George Behrman of Portland, Oregon who was one of eight sons of an immigrant German cabinetmaker. The family moved to Cornelius, Oregon shortly after the turn of the century and along with working the family farm, became noted barn builders. The abundance of wildlife provided a major source of recreational activity as well as provision for the Behrmans and this activity became a lifelong love for George whose interests extended to taxidermy as well. After WWI, despite the availability of factory birds and competitive prices, Behrman chose to carve his own decoys a practice he continued over the next 15 to 20 years. During these years he may have carved a few birds for hunting friends but the bulk of his birdcarving was done for his brothers and himself. With the depression, the depletion of waterfowl populations and an already sizable decoy rig he gave up carving until the last few years of his life when he carved a few decorative birds for his friends. George, in carving his decoys used native materials. Red cedar for the body and cedar, pine or fir for the heads. One of the most obvious characteristics of the Behrman bird is in the treatment of the head. The chin and throat are cut sharply back so that they notch deeply into the foreneck. The head sits back on the body and exhibits what is called a "proud breast." This very distinguishing feature of Behrman birds and the resulting relationship of the head to the body imparts a vitality and strength to the decoy which renders is lifelike and makes it a fine example of the craft. From a practical standpoint, the low neck style also did much to eliminate breakage and, from the excellent condition of decoys found in his rig, one would say he was quite successful with this head style. Behrman's painting style appears to be strongly influenced by those birds produced by the Detroit factories along with an observation of birds in the field and a knowledge of autumn plumage. Behrman perfected his technique on these birds and the quality of his work surpasses all but the best of Mason's painting. His keel weights generally were of flat bar lead. running the length of the body . . . the one most often used being a commercial product marked "Selby Bar Lead." 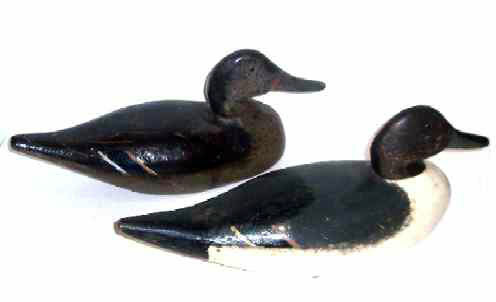 This pair of Pintails by George Behrman were carved for his brother Walter, c. 1920. They are classic Behrman, structurally sound with fine original paint showing some in-use wear. Ref: Wildfowl Decoys of the Pacific Coast, p. 97. West Coast decoys are starting to come into their own and attract the notice of collectors. They are an example of Northwest Folk Art well worth preserving.